One year ago last month, part of a Delhi slum was demolished; the demolition received almost no public attention. As politicians across India are speaking to the urban poor, asking for their votes and promising them secure housing, it is important to recall these events and the official attitude they represent. Sonia Gandhi Camp, Delhi on the day of demolition. CPR New Delhi. The executive engineer from the Delhi Public Works Department seemed quite sure of his own argument. He was standing in the middle of the Sonia Gandhi Camp, amidst the dusty debris of 40 demolished jhuggis, the brick and corrugated-metal huts that many from Delhi’s working class call home. The engineer who had overseen the demolition—an all-too-familiar experience for residents of Delhi’s informal settlements—justified it with this apparently self-evident logic. It is exactly the kind of reasoning, based on the assumption that residents of informal settlements are violating the law and therefore have no rights, that has justified decades of disregard for the people living at India’s urban margins. The Sonia Gandhi Camp is officially listed as a jhuggi jhopri cluster (JJC) by the government, a designation it shares with 684 other settlements in Delhi that are home to around 14 percent of the city’s population. Although ‘JJC’ is used interchangeably with ‘slum’ in many contexts, the two terms refer to separate types of settlements in the categorical hierarchy set out by the Delhi government. In this official lexicon, slum refers to a Slum Designate Area, a settlement identified in a piece of 1956 legislation. These ‘notified’ slums—part of a list that has not been updated since 1994 —are granted special administrative recognition and assured some level of basic services, as well as due process in case of eviction or demolition. JJCs, on the other hand, while officially recognised, are not granted the same legal protections; in the spectrum of the unplanned settlements JJCs remain the most vulnerable, at the very bottom of a city that can seem almost infinitely stratified. And while residents are afforded some protections, the ambiguity surrounding and selective enforcement of those rights mean that they are often trumped by the exigencies of the “formal” city—a city that views JJC dwellers not as citizens but as “encroachments”. At the Camp that day, in mid-April 2013, furious residents gathered around the executive engineer’s assistant, seeking an explanation. Behind him stood the brick and tarpaulin rubble of homes that they had built and improved over the last two decades. The government estimates that before the demolition, the Camp contained 150 jhuggis. But, explained the executive engineer, 40 of those 150 homes stood in the way of the road expansion he and his agency were planning. “Even if this was a mandir [temple], I’d have to take action to demolish it. The Supreme Court says so. … It is on the right of way”. The phrase “right of way” provided the government with a technical sounding justification not only for the demolition itself, but also for disqualifying the newly homeless residents from any alternate housing. There had been a brief period—between February 2010 and February 2013—during which the Delhi Government’s slum rehabilitation policy contained a “right of way” exception. This meant that those found to be on the “right of way” would not be eligible to be considered for rehabilitation: their homes could be demolished with no obligation on the part of the government to provide alternative accommodation. But the concept of “right of way,” on which this life-altering exception was predicated, was never defined in any policy document, a fact pointed out by the Delhi High Court in a landmark decision (Sudama Singh v. GNCTD). In February 2013, two months before the demolition at Sonia Gandhi Camp, the “right of way” exception had been removed from government policy. In other words, the Government had a legal obligation to provide alternative accommodation for displaced residents. The Delhi Urban Shelter Improvement Board had been established in 2010 to replace the Slum and JJ Department of the Municipal Corporation of Delhi and coordinate the rehabilitation of JJCs in Delhi that sit on land owned by state agencies like the Public Works Department. The engineer was correct that the DUSIB assists with relocation, but it cannot do so unless it is informed about a demolition before it happens. But he and his agency never told the DUSIB about the demolition they were planning, and once a settlement has been razed, it is nearly impossible to undertake the surveys and verification necessary to relocate residents. In the Sonia Gandhi Camp, one bureaucratic failure resulted in a questionably legal demolition; another meant that the resulting homeless were not provided alternative accommodation. This is a story of broken procedure and incomplete policy, but it is also one that exemplifies a megacity’s attitude towards the huge swathe of its population that it perceives as an impediment to becoming a ‘world class city’. It is a pattern of urban development that too often loses track of the many textures of human settlement that make a city. A year later, some residents have rebuilt their jhuggis further inside the bounds of the Camp, while others have gone back to their villages. In the area where the forty households stood before the demolition, the Public Works Department has planted flowerbeds inside concrete containers. 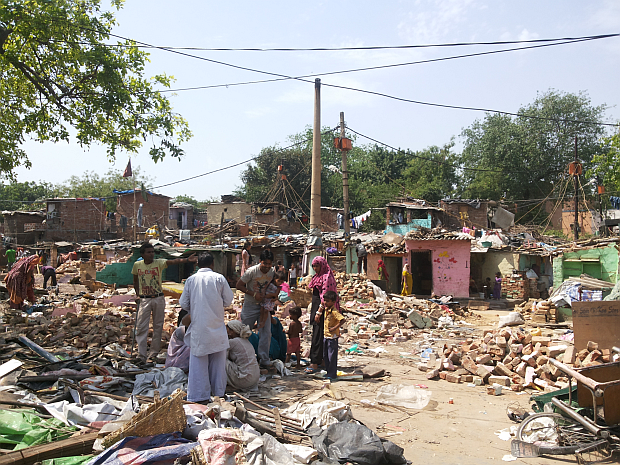 Demolitions, evictions, and resettlement are not new experiences for residents of JJCs in Delhi. Since the 1960s, there have been at least three waves of JJC resettlement in Delhi, the most recent just prior to the 2010 Commonwealth Games. In that cycle, 217 JJCs were demolished, displacing more than 50,000 households. Since 2010, the pace of demolitions has slowed, but it’s never stopped. Although various policy and legal documents detail mechanisms for eviction and relocation, like surveying and criteria for eligibility for rehabilitation, residents of Sonia Gandhi Camp fell through the cracks of this patchwork of due procedure. There is no consensus between state and central government agencies about who has the authority to evict, and the responsibility to relocate, JJC residents, and so there is no common understanding about how to undertake these processes. It is the Delhi High Court that most poignantly explains the stakes of this failure: “It is not uncommon to find a jhuggi dweller, with the bulldozer at the doorstep, desperately trying to save whatever precious little belongings and documents they have, which could perhaps testify to the fact that the jhuggi dweller resided at that place”. The Court’s words are a reminder that there is a human truth evident on the ground, which might just overcome a fragmented and incoherent bureaucracy.